Dramatic reading of Mervyn Peake's Boy in Darkness, the second installment of Peake's Gormenghast trilogy featuring the hero Titus Groan, on WBAI's Mind's Eye Theatre. Venturing into a trackless waste from his ancestral castle, Titus falls in love with two villains, a hyena and a goat, who deliver him into the hands of one of the most blood-curdling of literary villians: a white lamb. The cast includes Sara Dalton, Cliff May, Albert Norton and Gordon Spencer, and the narrator is Mitchell Taylor. Produced by Baird Searles. Permission to use the story was granted by Mervyn Peake and the story is published by Ballantine Books. Technical director, David Rapkin; Produced and directed by Baird Searles. 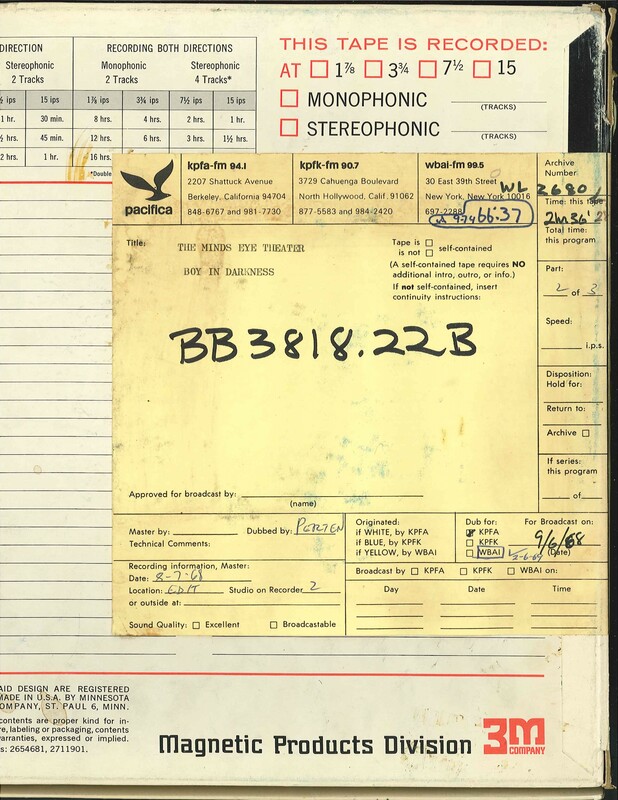 This recording was formerly cataloged as BB3818.22B. 3 reels (158 min.) : 7 1/2 ips, mono.